At Residences at Falcon North, our goal is to offer an inviting atmosphere for our residents that will have them feeling right at home. Our apartments near Briargate are full of convenient amenities, allowing you to live comfortably in our Colorado Springs apartment complex. 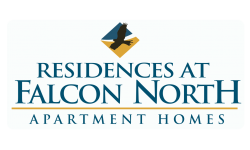 View our photo gallery to see all the excitement you can experience at Residences at Falcon North. If you have any questions about our apartment complex near Briargate, please don't hesitate to contact us through our website. If you're interested in one of our Colorado Springs apartments, feel free to apply online today. We can't wait to hear from you and give you a personal tour of your potential new apartment!